Flying squirrels are grayish-brown with white underbellies, have long bushy tails, weigh 2 – 4 oz, are 8 – 10 inches long and have large black eyes. Their call is bird like and faint and can be heard early in the evening during spring and summer months. Flying squirrels are common in most forested areas through out the eastern United States. The preferred nesting sites are woodpecker holes in trees but they will also make nests of twigs and leaves in trees. Flying squirrels are omnivorous and eat bird’s eggs, buds, flowers, fruit, fungi, insects, snails and slugs, spiders, seeds and tree sap. If flying squirrels have invaded an attic you will hear their activity anytime between dusk and dawn. Flying squirrels will have an area designated for droppings instead of leaving them through out the space. 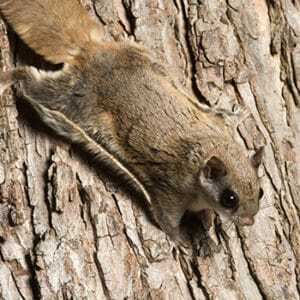 Although Flying Squirrels don’t in fact “fly”, they can glide for distances of up to 295 feet. Mating seasons run December to March and June to July resulting in litters of 2 to 4 after a 40 day gestation period. The young are born hairless with internal organs visible through the skin but become self sufficient after 2 1/2 months.